So... anyone else get the email from Stila this morning about their new nail polish sets? I almost choked on my coffee. They look awesome. An exquisite four piece collection of glittery nail polishes in pretty, wearable shades. Add a touch of sparkle to your nails with these dazzling, yet subtle shades that compliment almost any look. 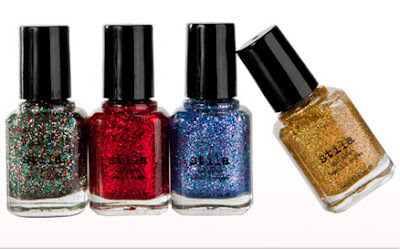 A sensational, four piece collection of glittery nail polishes in fun, vibrant shades. Add a pop of colorful sparkle to nails with four eye-catching nail polish shades infused with twinkling micro-glitter. I got this email too and they look so fun! Definitely look like Color Club but I'm such a hoarder I may need to get these! Oh my. Those glitters do look lovely but $24 is a bit much for a set of minis. Maybe they do share the same bottle provider? Yeah I was choking on the price for the tiny bottles. YES! I agree - when I first saw them, they reminded me strongly of Color Club. Looks like they're trying to compete, but...c'mon...$24 for a mini set is a bit much. Color Club has them beat in price! Still...I'm curious to see these in person, especially Confetti and the ones with rainbow glitter. ooh i can't wait to see these swatched!! Wow, does Stila normally have nail polish? I've never seen it before... and yes that's a lot for 4 mini polishes. gah! I need both sets! But I don't need 2 gold glitters.... or do I? Chandelier looks potentially interesting! But yeah, $24 for four minis? So they're half-sized, which means if they were a full .5 oz they'd theoretically be $12 each? Not insane, but sold as a set when I'll invariably only want *one* of the set.... ehhhh. I have two old Stila polishes from the 90s.... Hebe and Isis. I am so not excited for these at all. First, 0.25 fl. oz. MINI bottles at $6 each? They must've fallen and bumped their heads. Second, they are highly reminiscent of Color Club bottles and the colors of the Beyond the Mistletoe collection for this year. And third, almost none of these colors are unique! I can think of at least two dupes for Confetti (green, red, and silver glitter in the Daring collection) off the top of my head. China Glaze has this exact shade in the Let It Snow! collection (Twinkle Lights), and I'm 100% sure OPI has a shade just like this as well. City Lights, Disco Ball, and Chandelier look very very similar to the colors OPI released in the Burlesque collection last fall. And there's been a million releases of colors like Icicle, such as China Glaze Snowglobe and Deborah Lippmann's Stairway to Heaven this year, and Color Club's Snowflakes last year. I did not subscribe to stila's,,,I am going to now!!! >"< these are so cute!!! I didn't realize these were so little. I wasn't very excited by these. They do look like Color Club glitters. A little to expensive for the size also. they are beautiful, but they are making my bank account hurt!